What kind of TV cover is best for outdoor use? Can’t I just buy a fabric cover for my TV? This is another question we often get. And the short answer is you can. Just be aware of “greenhousing” your TV. Potentially killing it quicker than having no cover at all. The major issue with using a fabric cover is that a lot of them actually trap condensation and moisture under them. This causes something akin to a greenhouse effect, with the potential to kill your TV faster than having no cover at all (assuming it is of course installed under an awning or gazebo to begin with). Gaps in the cover allow moisture to collect inside and under the cover. No good. How does this happen? Most covers slide over the top of the TV, with a drawstring at the bottom to tighten. Some cover the TV from the front, with velcro straps to connect the cover up and around the TV mount. These small gaps allow moisture to get into and under the cover. On a rainy day or a dewy morning, evaporation draws moisture from the ground and surrounding wall up through those gaps, where it is eventually trapped. The darkness created by the cover itself prevents the moisture from evaporating any further, leaving it on the inside of the cover, mixing it up with the very TV you were trying to protect. You just “greenhoused” your TV. SealTV’s enclosure design combats that in a number of ways. First the enclosure has a double seal around the front door, keeping it tight from any liquid or moisture ingress. Second, where the enclosure is vented to allow it to draw in cooling air, and expel hot air from the TV, we use a system of baffles to trap the moisture before it gets inside the enclosure. The second major issue with a TV cover is they have to be removed to watch your TV. The hassle of having to get up on a ladder or step to remove the cover, quickly kills off any impulse use. 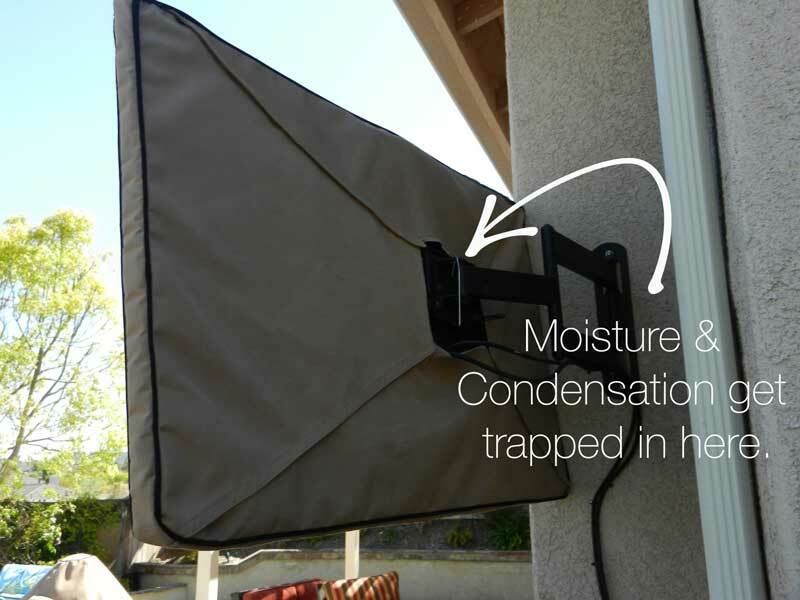 The result: your outdoor TV never gets watched. To much hassle to get it setup and working, so it ends up collecting dust. We have designed our enclosures to be impulse ready, and hassle free to use. The UV protected glass or polycarbonate front panel on our enclosure means that you can watch TV at any time with the enclosure fully closed. The transparent glass or polycarbonate doesn’t interfere with the remote control, so you can use your outdoor TV, just as easily as your indoor TV. The convenience of this means that you will get a heap more usage out of your TV, rather than it being used for special events only. More use means more value – and ultimately that’s what we strive to give our customers. This entry was posted	on Tuesday, August 5th, 2014 at 2:18 pm	and is filed under Blog. You can follow any responses to this entry through the RSS 2.0 feed. Both comments and pings are currently closed.